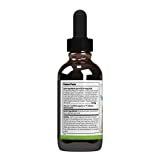 Young at Heart is a liquid formula for canines, combining eight unique herbs. Together, these herbs have a gentle action on the body to support the health of the heart muscle, heart valves and blood vessels. Young at Heart is a formula designed for your canine's entire cardiovascular system. In particular, it helps to support and maintain the normal muscular integrity of a healthy heart, the valves of the heart, and regular circulation of blood through the blood vessels. Additionally, Young at Heart contains herbs to support the heart's rhythm and healthy blood pressure.